TICKLING GIANTS is a funny/serious documentary about the business of satirising corrupt politicians. In this case, it's the story of the charismatic Egyptian heart surgeon, Basseem Youssef, who started making youtube videos satirising the old dictatorial regime of Hosni Mubarak. 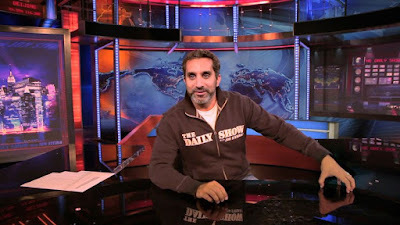 Before he new it, viewer numbers were through the charts and he had a prime time show called The Show, in the manner of Jon Stewart's Daily Show. The two hosts are clearly sympathetic and inspirational to each other, and they have appeared on each other's programmes. But things took a darker turn after the Arab Spring. The people may have put Morsi in power but soon it was his military commander Sisi who had staged a coup and ushered in an even more repressive government than that of Mubarak. Suddenly Basseem Youssef is being summoned for arrest, his show is threatened with being taken off air, and becomes the top news story. He jumps to another channel, but Sisi's regime jam the signal when he refuses to tone down his criticism. Youssef worries about his family and employees and questions if keeping the show on air is worth the candle. TICKLING GIANTS is an important story on two levels. First, it reminds us of the importance of satire and how lucky we are to live in countries where it is fostered. TV shows like Newzoids or The Daily Show or - back in the day - Spitting Image - are a key pillar of a healthy democracy. Indeed, one could argue that one of the factors behind the rise of Trump is that Jon Stewart retired from The Daily Show and his successor is a toothless tiger. Satire, when done well, is powerful. Tina Fey as Sarah Palin was powerful. And that's why dictators fear them. The second brilliant thing about this documentary is that it takes us behind the scenes of Egyptian politics, which may seem impenetrable to us outsiders. How much more fascinating and entertaining to see the impact of the change in regimes from the point of view of young satirists than by reading ponderous dull articles in The Economist or FT? I came out of this documentary having had a good time, but also having been educated about Egypt. And most importantly, with a newfound respect for those people who are brave enough to "tickle giants" in repressive regimes. These people are doing important work and should be lauded. After all, we live in a time where being a journalist is becoming increasingly dangerous - where in Turkey and Russia, you can be locked up for doing your job. We need more docs like these that shine a light on this abuse. TICKLING GIANTS has a running time of 111 minutes and played Tribeca 2016. There are still tickets available for the screening on Wednesday 12th October at the BFI London Film Festival.